If you are looking for something different to do together whilst in the big city, then this Thames Rockets Speed Boat Voyage for Two may just be it. An exciting, fast-paced and unique way to experience the capital away from the hoards of other tourists, you’ll skim across the surface of the River Thames, taking in the sights, sounds and stories that this waterway has to offer whilst enjoying the ride. Aboard this purpose built Rigid Inflatable Boat (and the Visit England’s ‘Family Friendly Attraction of the Year’ for 2017/18), you’ll have the pleasure of an experienced guide, giving you nuggets of information along the way as you pass famous landmarks such as The London Eye and Tower Bridge. But this isn’t a gentle meander across the Thames, the RIB is capable of 35 knots and you will feel the buzz as the boat speeds through the water in this adrenaline-packed sightseeing tour. Make your day out in London one to remember. The two of you will be greeted by a member of staff, receive a quick briefing and be handed any safety equipment you require. With an experienced tour guide on board you will buzz over the water with speed and style whilst viewing the most popular sights of London. You’ll find yourself under the amazing Thames Bridges and exploring parts of the river that are inaccessible to other boats. Don’t forget your camera. Voyages run seven days a week March to October and on selected days during winter. Availability is restricted to 11.00 only on Saturday and Sunday. The experience lasts approximately 50 minutes on the water, however you should allow up to 1 hour 30 minutes for the whole experience. "Great speedy and fun day at Thames Rockets!" Staff were great, helpful and had a smile on their faces. The trip was awesome! Bill the guide was entertaining and funny, but had good knowledge of history. Well done team! Thames Rockets couldn't of made our wedding anniversary, memorable. Dave and Phil certainly no how to make the experience enjoyable for all ages and abilities. Thrill and educational. Will book again with a group of us. We took this speedboat ride in early September. I was a bit nervous having never really been on a speedboat before but wow!! I have to say it was honestly the best thing I've done in London. Our guide was sooo funny (big ginger bearded dude) and came around to talk to everyone making sure we were all ok and getting to know us a bit. The fast part happens after Tower Bridge and I was grinning from that point until the end of the day. A must do in London. 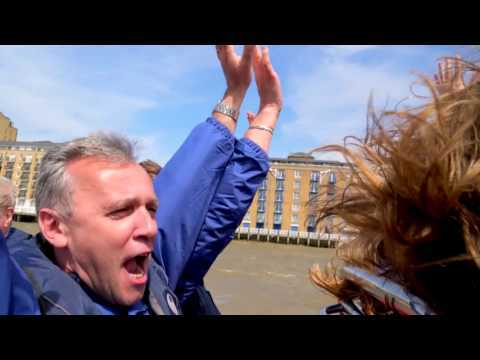 Thank you London RIB Voyages! Have done this experience with the same operator every year for the last five (with different groups, family, friends etc)... Ever year I think "it won't be as good as last year" and every year I am wrong. I enjoy it as much and even though I know I am being a hard to please customer I come away not being able to fault them in any way shape or form. From booking (with an actual human being!) to the trip on the river it is superb. If you do one thing in London this year, do this. You won't regret it. Be careful not to book with another provider, my friend fell into this trap trying to save a few pounds and deeply regretted it. These guys know what they are doing, you need the red boats.